DVD, Soft Cover Exercise Manual, and Resistance Band. Order all three items and save 20%. The Pink Ribbon Program DVD is 44 minutes of gentle exercises focusing on improving mobility, function and quality of life for breast cancer patients. These surgeries include lumpectomy, mastectomy, and breast cancer reconstructive surgeries; including TRAM flap, LAT flap, DIEP Flap, and Implant reconstruction. 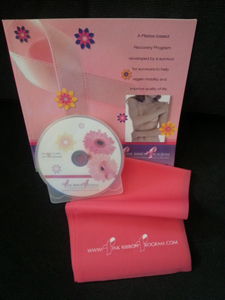 The Pink Ribbon Recovery Manual is designed to facilitate recovery from breast cancer surgery. These surgeries include lumpectomy, mastectomy, and breast cancer reconstructive surgeries; including TRAM flap, LAT flap, and implant reconstruction. This program also reduces the risk of lymphedema. The Pink Ribbon Recovery Program has been embraced by hospitals, physical therapy centers, educational institutions, rehabilitation clinics, and by survivors managing their own physical recovery. THE PROGRAM: Everyone is different and heals at his/her own pace. Talk to your doctor or healthcare team member before starting this or any exercise program. The Pink Ribbon Program works in conjunction with your doctor’s recommendations for an exercise program. You may also use this program in conjunction with, or as a follow-up to any prescribed physical therapy. There are four phases to The Pink Ribbon Program. Each phase should be maintained for two weeks. The progression from one phase to the next will depend on how you are feeling. You can participate in these exercises two to three times per week. Once you have completed this program, you are now ready to join in many types of mainstream activities. Please be aware of any ongoing limitation you may have due to your surgeries. PHASE I can begin as soon as possible following surgery. This is done in order to prevent tightness and/or swelling. Movement promotes blood flow which will increase oxygen supply. This helps to aid in the healing process. The exercises in Phase I focus on range of motion of the shoulder, chest expansion and scapula (shoulder blade) stabilization. PHASE II focuses on improving trunk rotation and lateral flexion (side bending movement). Spine and core stability exercises are added in this phase and we continue with shoulder range of motion exercises. PHASE III adds more strengthening exercises for the core and we begin to incorporate lower body strength and stability exercises. Phase IV introduces the use of resistance to the workout. A Resistance Band is used to strengthen the muscles of the back, shoulder, and trunk.